Not many of you all know this, but my background and education is in the fine arts and design. I find absolute peace and truth in my love for painting, and yet I admit that I have neglected practicing it for far too long. Art is so personal and can express and capture the essence of a moment, a vista, an experience. 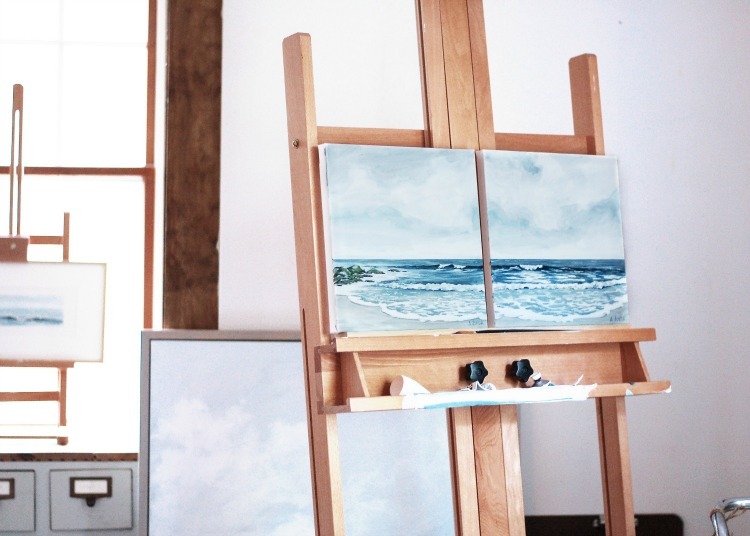 This year I want to introduce you to coastal artists and artisans that I admire and love. My hope is to feature a new artist each month. 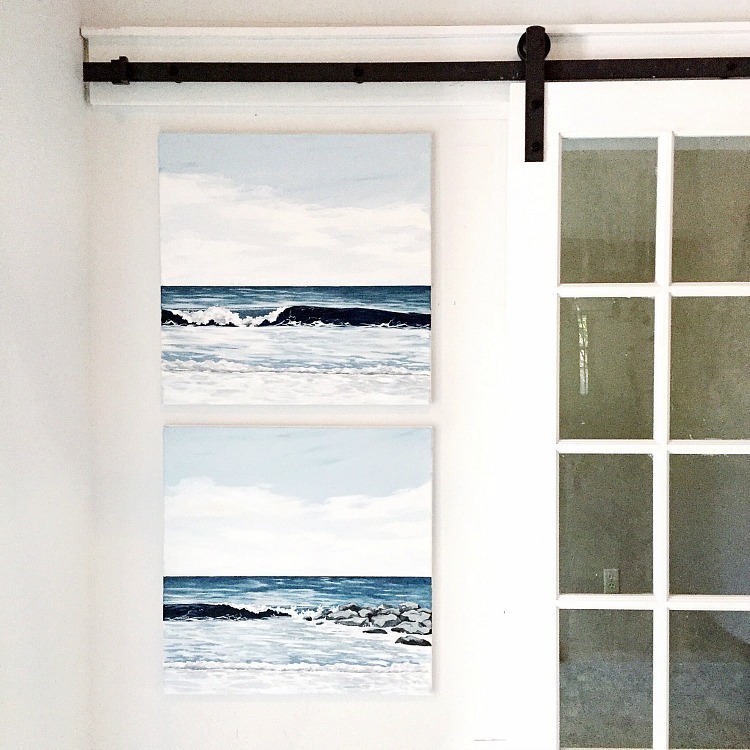 This month the featured artist’s works are the Beautiful Ocean Paintings by Alison Junda. 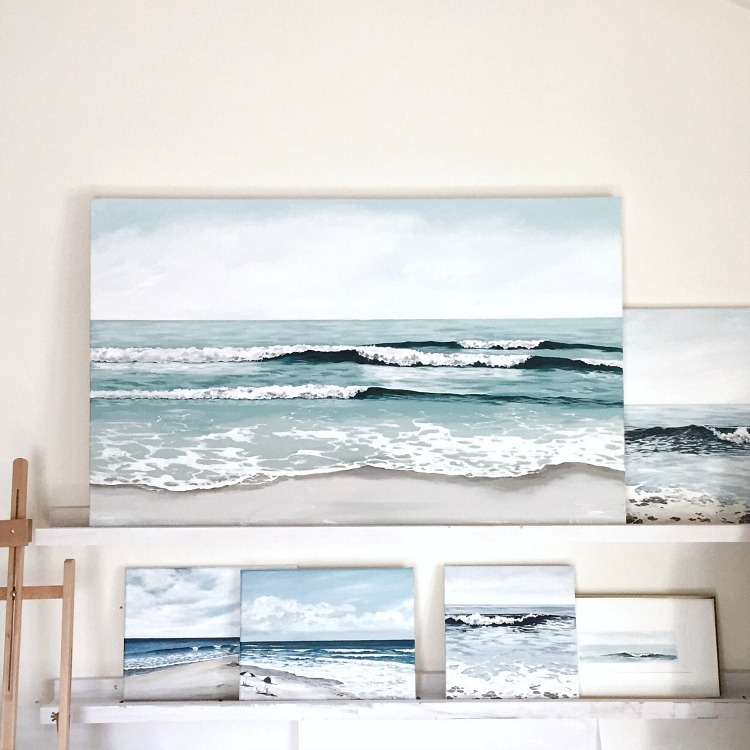 Alison Junda is a coastal painter and designer living curently along the shores of Pleasant Point Beach, New Jersey. 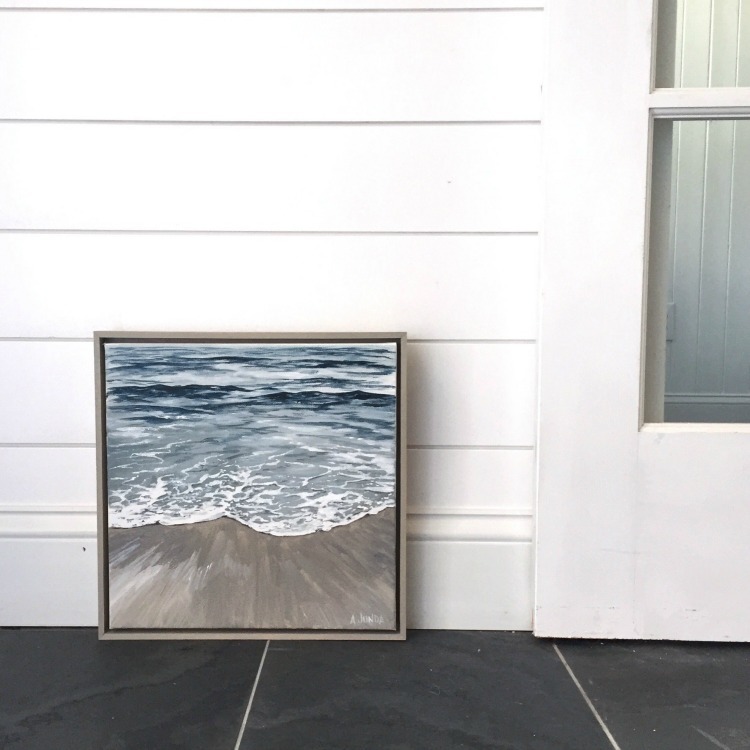 Her paintings have a photorealistic quality that make the viewer feel as if they are walking along the beach, feeling the wind whip along the sand and hearing the waves crash upon the shore. 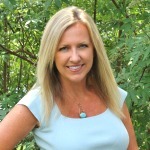 Alison is a frequent visitor of the Outer Banks, or OBX as we call it. They are the beautiful barrier islands that border the coastline of North Carolina and offer picturesque coastal solitude. The OBX are where our family escapes our local coastal tourism traffic and vacation each summer. Her ocean paintings of deep navy blue cresting waves and receding tides with white seafoam instantly reminded me of the OBX coastline. Alison’s and my backgrounds hold so many similarities. It’s just so amazing when you are drawn to art that speaks to you and then you learn that the artist has lived and walked along the same shores as you! One crazy coincidence I discovered was that she studied art at East Carolina University. I was like…. really? Are you kidding me? I lived in Greenville, NC where ECU is located my senior year of high school. My time there was brief, but my father taught at the medical school and I spent many a weekend evenings … ahem…at ECU. 😉 So many similarities that confirmed why I instantly felt connected and love her art even more! Ok, enough about our similarities. You all need to just sit back, gaze, and enjoy her gorgeous acrylic on canvas paintings. Alison captures the light and reflections of the sky upon the water beautifully. She offers paintings available for immediate sale and offers personalized commisioned works. Check out and follow her Instagram page and on Facebook too! 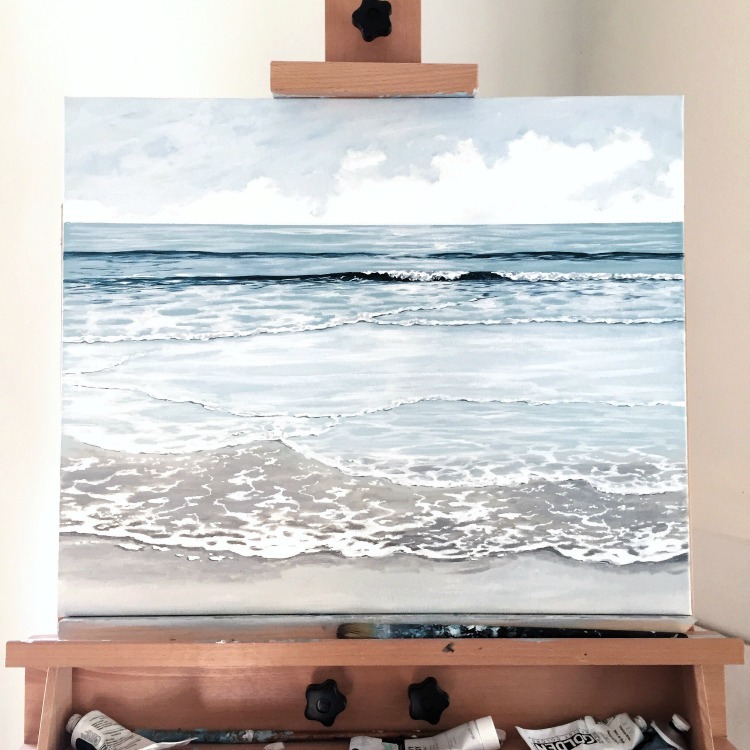 Let me know what you think of her beautiful ocean paintings and please give her some lovely comments and follows below! OH my word, thank you so much for sharing these!! Amazing. 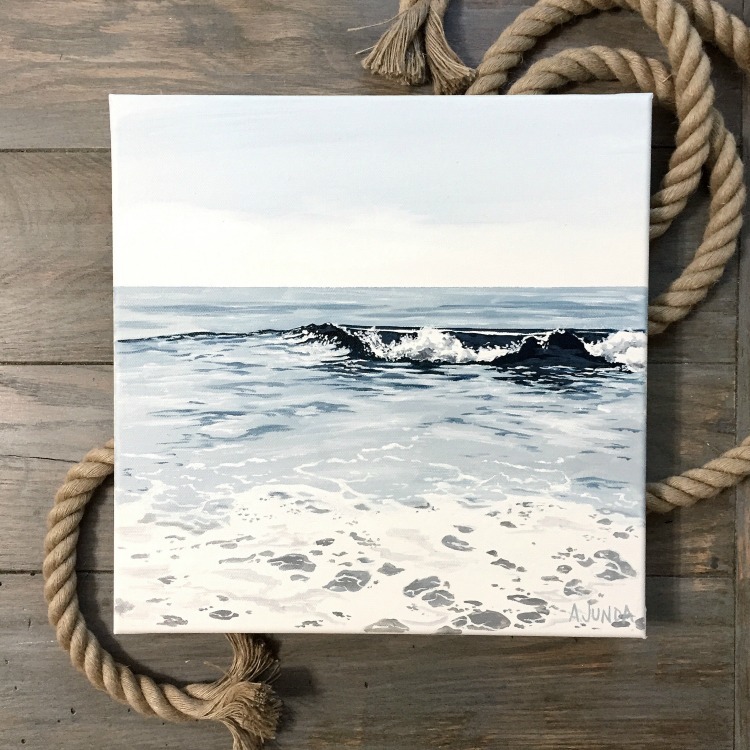 We are building our dream beach home and will be needing unique art pieces – these are on my list! Aren’t they beautiful? Absolutely keep her in mind for your home! She’s working on more paintings as we speak. Thanks for stopping by Susan! Kim, these pieces are just beautiful! Her attention to detail and use of color really draws me in. I live on the Carolina coast and these pictures say, “home,” to me. Thanks so much for sharing! Thanks Kim! I totally agree! She captures our water and coastline so perfectly! Thanks so much for stopping by! Alison is one of my absolute favorites. I have one of her amazing Christmas ornaments. I will be purchasing more from this amazingly talented artist. Oh yes! Her ornaments were so cute! I live on the west coast and it’s amazing how different each is. Would love one of Allison’s pictures to hang by one from out here. So beautiful. I am not familiar with this artist! Thanks for sharing her beautiful work with us! We are looking for some art pieces so I am excited about this new series! I just recently discovered her on instagram….LOVE her work! Thank you so much Kim! I love your design style and I appreciate your encouragement! You are so very welcome Alison! I’m thrilled that you agreed to be my February featured artist! LOVE Alison’s artwork. Maybe because I’m an ECU grad (Go Pirates!) and lover of the NC coast…especially Topsail Island? Thanks for sharing! Isn’t her work lovely? Topsail is beautiful! I have several friends with homes there. Alison is so very talented and kind too! Thanks so much for stopping by!